Seaside Village is one of the smallest villages in New Seabury, consisting of one street, Shore Drive West, with homes on each side of it. It’s one of the more recent villages in New Seabury, having started to be built out in 1994. The plan for the village envisions twenty five single-family homes, built along Nantucket Sound on one side of the street and along the Ocean Golf Course on the other. To date, there have been built seven homes on the Sound side and seven along the golf course for a total of fourteen. Additional homes are under construction. We are hopeful that it won’t be too long before the village is completely built to its foreseen complement of homes and appropriate landscaping. The homes on Nantucket Sound enjoy stunning ocean views while others have breathtaking vistas of both Nantucket and Vineyard Sounds and the adjoining Ocean golf course. 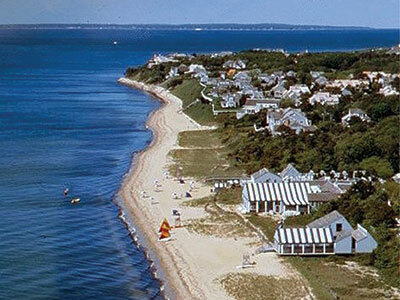 The village is centrally located in New Seabury, and within walking distance from the new Club House, the Popponesset Inn, the Beach Club, and the Cabana Club. Because we’re a relatively new village, the landscaping of it is still in process of developing into what is envisioned as a work of art, worthy of the village’s enviable location.